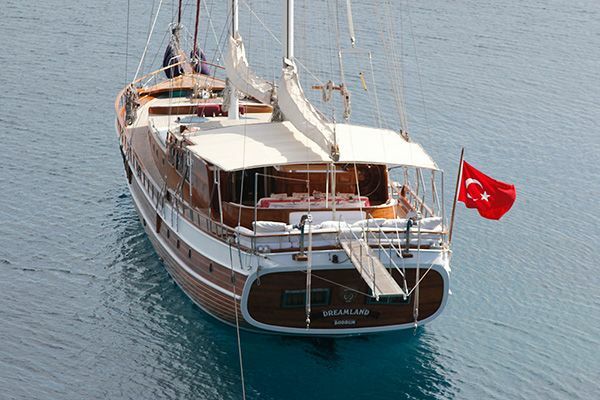 The Luxury sailing gulet Tango Charlie packs a lot of class and style into her 26 meter 4 cabin hull. 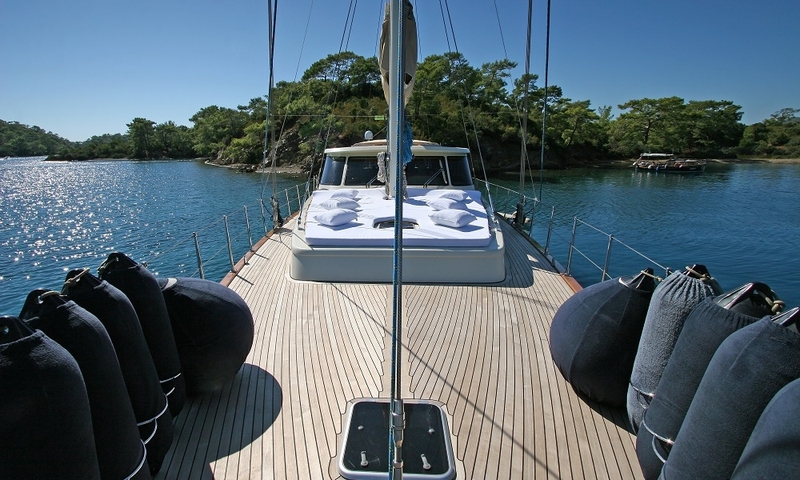 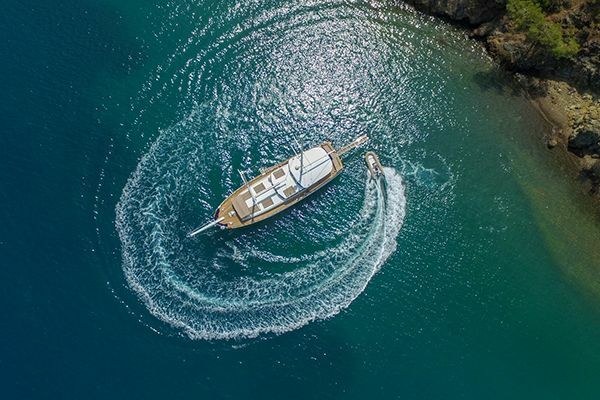 With her distinctive Black Sea built white hull standing out amongst other gulets on the Turkish Riviera, she offers all the comforts of gulets with sloop design and sailing rig, as well being a modern and immaculately kept charter yacht. 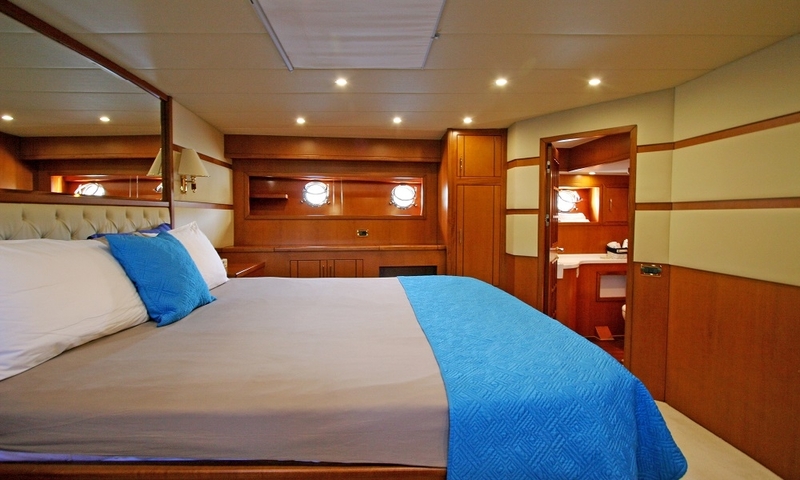 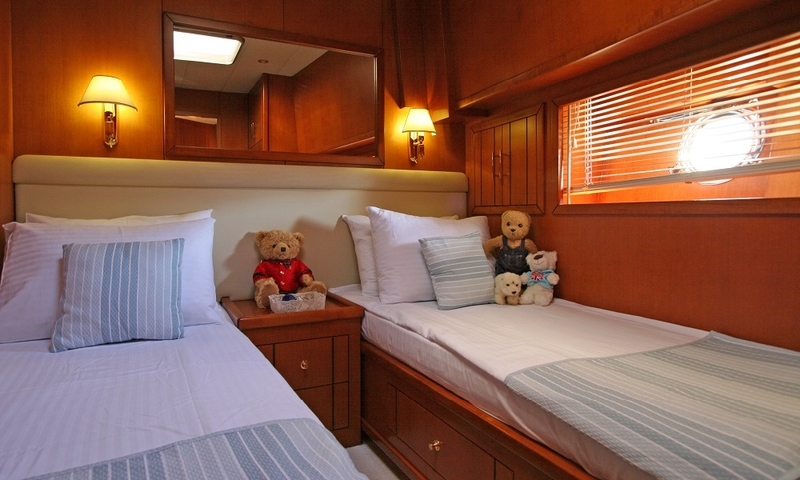 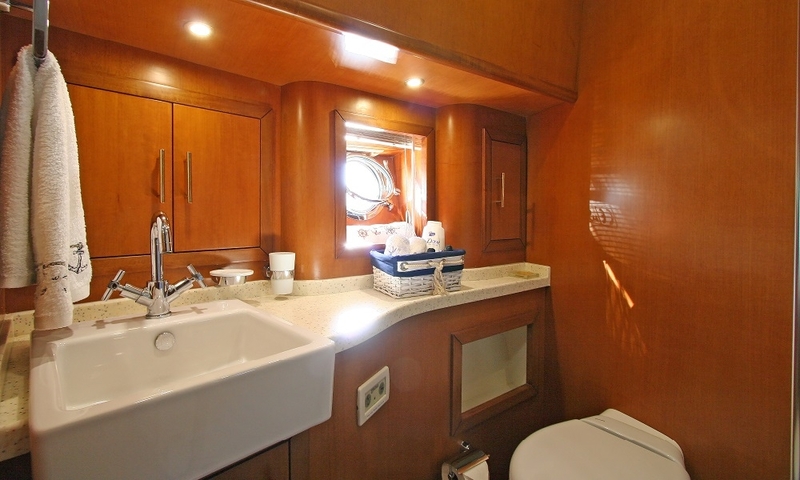 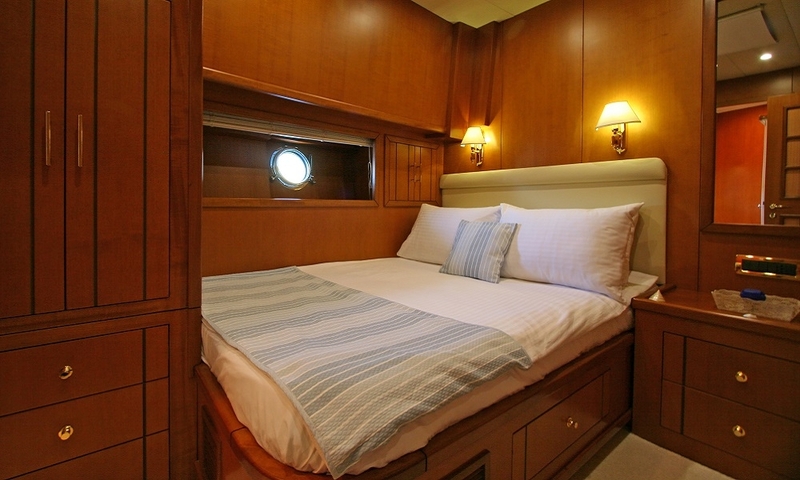 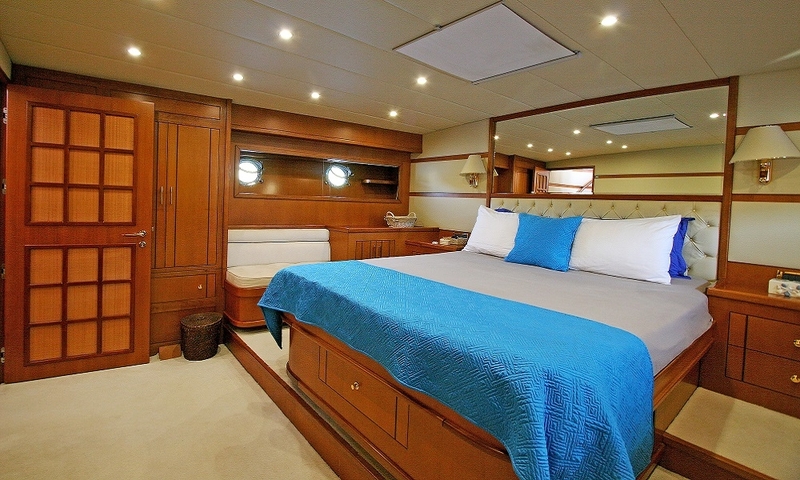 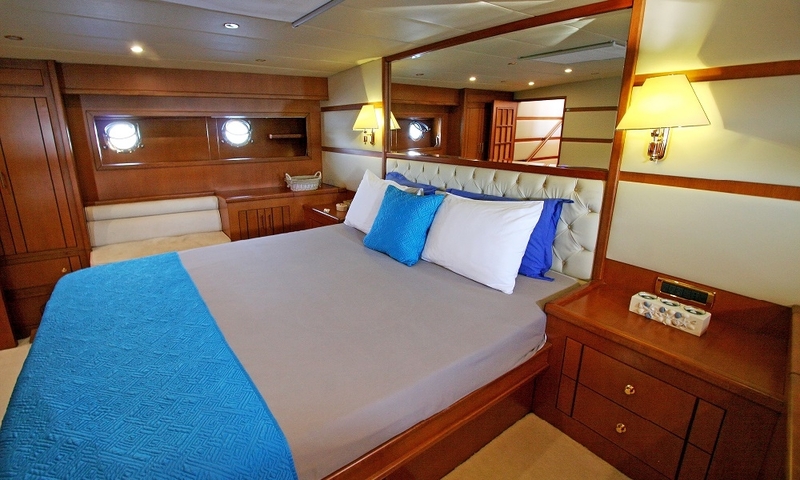 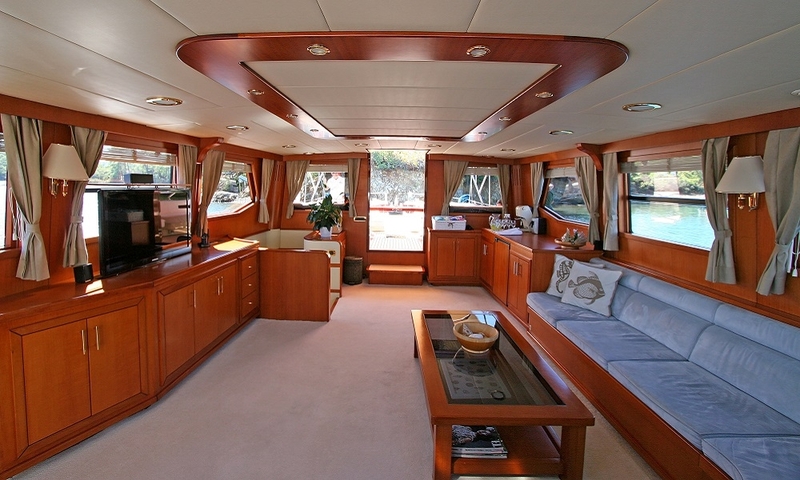 Tango Charlie holds just four spacious comfortable cabins; the VIP master cabin aft with the walkaround King size bed, and the forward master cabin with the walkaround queen size bed, one double bed cabin and one twin bed cabin. 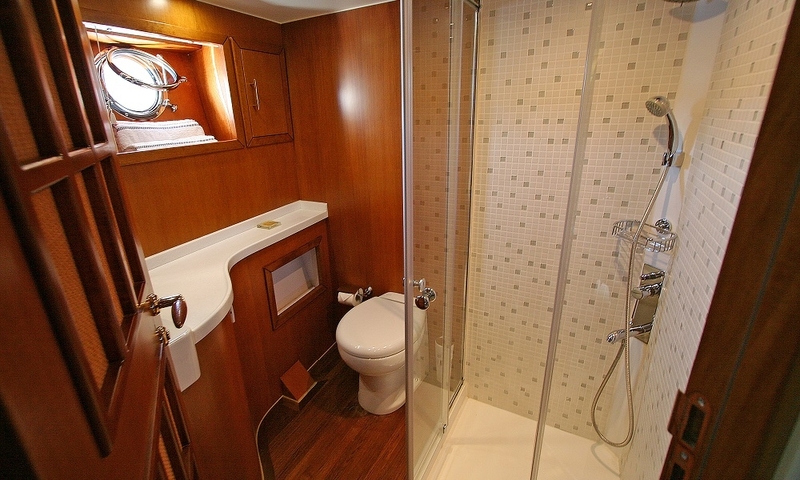 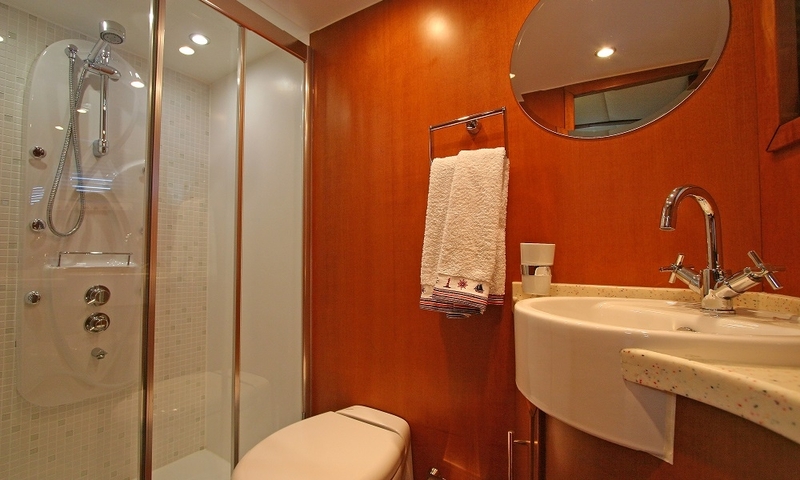 All cabins having their own well-designed shower bathrooms complete with the thoughtful provision of hair dryers. 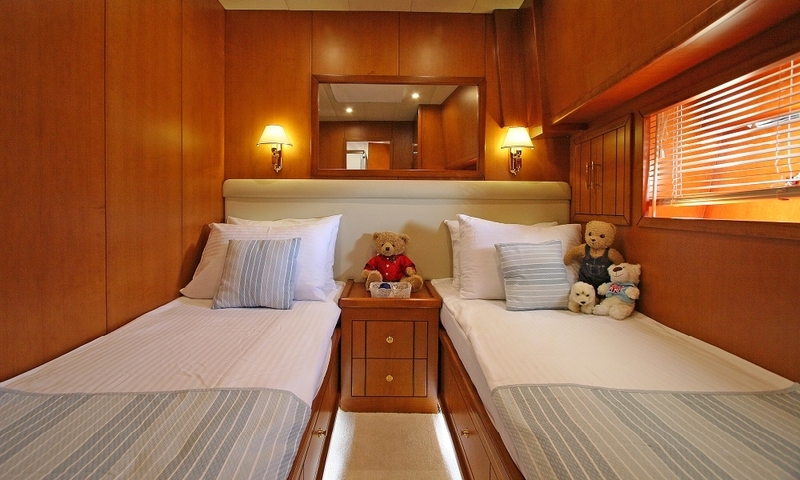 Air-conditioning is run throughout the cabins, and in the spacious saloon which is more like a cosy lounge with a long cushioned seat for relaxing indoors with a pop-up plasma TV and hi-fi music system. 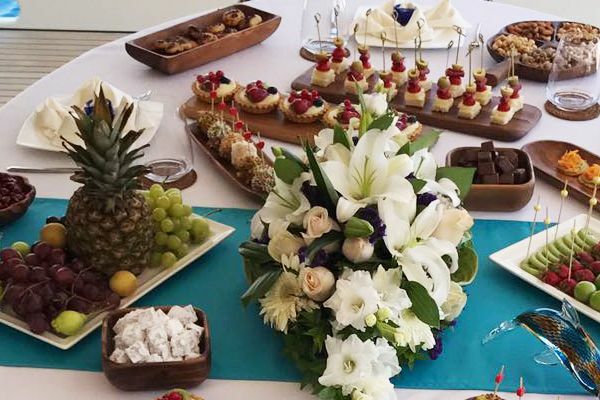 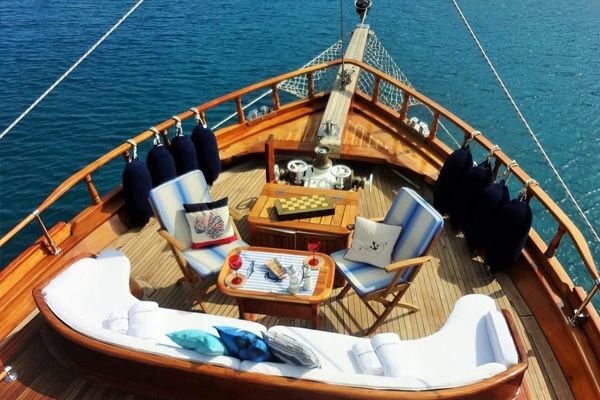 But the cruise is all about the outdoor life in the fresh air, be it reclining in the shade on the inviting cushioned bench around the alfresco dining table on the aft deck, enjoying the best of Turkish dishes cooked and served by the crew, or relaxing on the foredeck sunbeds. 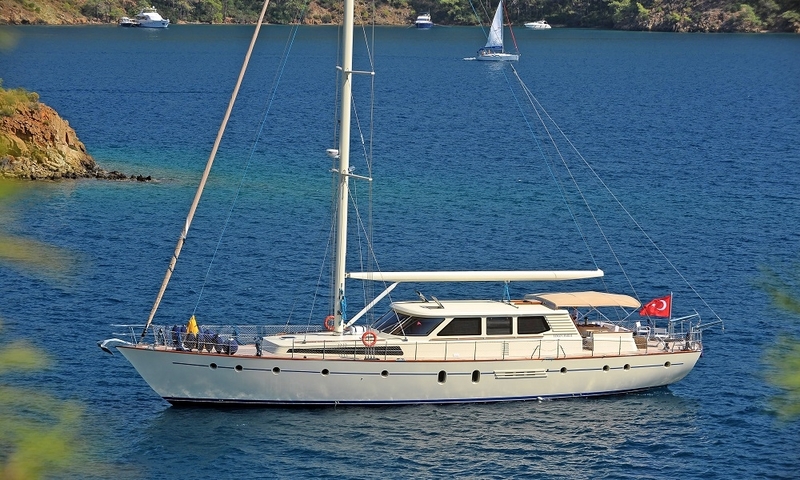 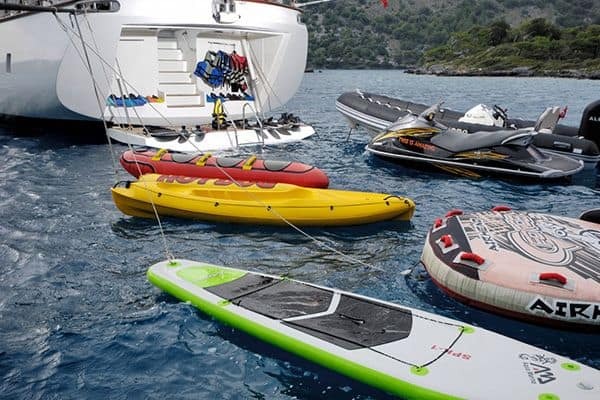 The gulet Tango Charlie is well equipped with watersports like windsurf board, canoes, wakeboard and snorkeling gear for the active water loving guests who will thoroughly enjoy the crystal-clear blue waters of the Aegean. 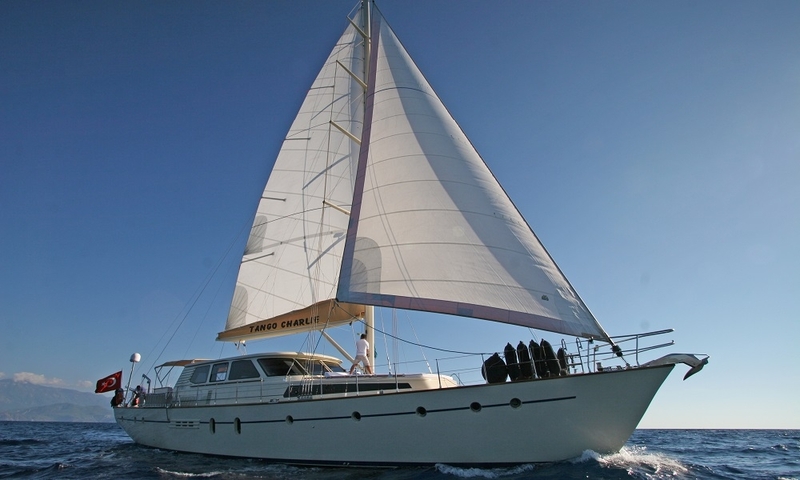 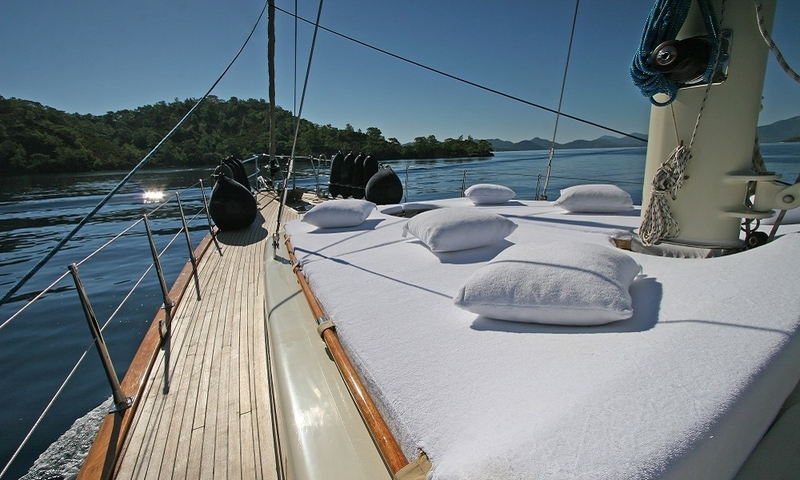 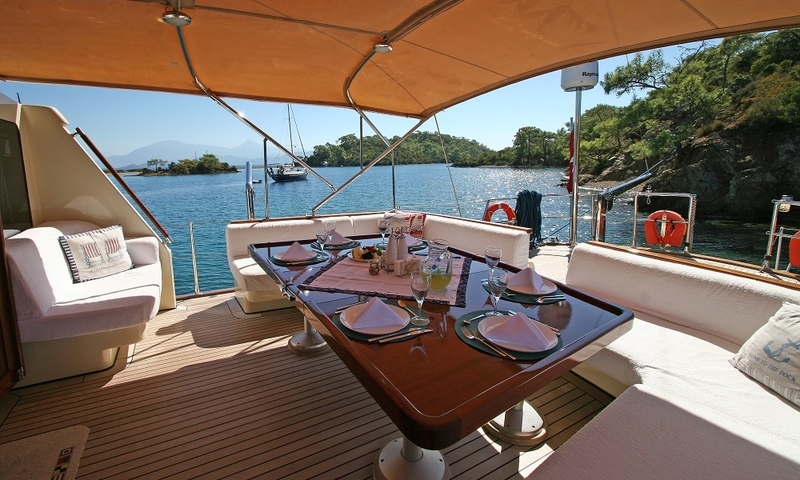 The captain and three crew of the Tango Charlie gulet are prepared for all tasks on board and pamper their guests while taking them to the quieter coves, as well as the coastal towns and villages, for just the right mix for your relaxing gulet cruise along the Turkish coast or amongst the Greek Dodecanese Islands.